Spicy Tangy Fish Curry is an extremely delectable Fish curry popular in Kerala and South Indian states. Also, known as “Meen Kulambu” or Meen Kuzhambu, this classic dish has intense flavors to tantalize your taste buds. The tamarind and tomatoes gives the tangy flavor and the spices are balanced with rich coconut milk. 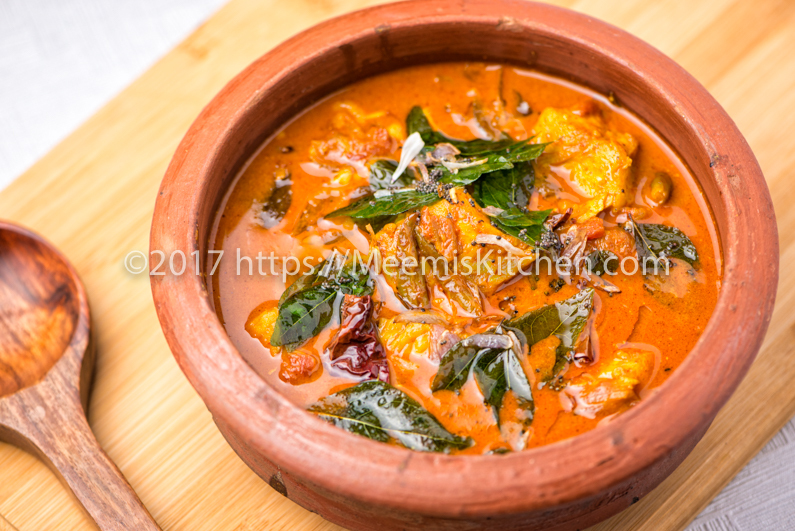 A perfect blend of hot and sour flavors, Spicy tangy fish curry is a soul warming fish curry, best enjoyed with brown Kerala Rice and tastes good with Idli, Dosa or soft Appam also. 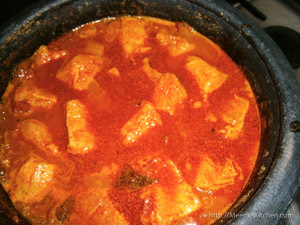 In Kerala, this Spicy Tangy Fish curry is popular and devoured like other Kerala Fish recipes. Being a coastal state, there are no dearth of seafood recipes and the tourists feast upon the spicy yet tangy dishes. Alleppey Fish curry, Spicy Kottayam Fish curry, Fish Masala, Mathi Peera, Fish Moilee, Ayala curry, Prawns roast, Squid roast, Kakka Erachi/ Clams roast, Karimeen Mappas etc are all Kerala specialities that are to die for! 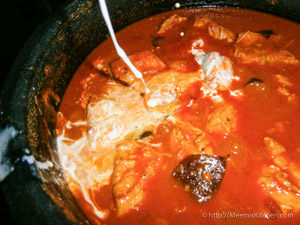 The wonderful flavors of Spicy Tangy Fish Curry can be attributed to the perfect blend of ingredients and to the earthen pots/ clay pots that are used for cooking. Any fleshy white fish can be used for this preparation. I used Chembally (Red Snapper) this time; have tried with King Fish(Aikkoora) also, and it came out fantastic. To enhance the flavors, this spicy Tangy Fish curry should be allowed to rest for 2 hours or more, for the fish to soak up the flavors. It can be enjoyed with all varieties of carbs like Rice, Kappa vevichathu (mashed Tapioca), Dosa/ Idli or Appam. Like any Keralite, my choice is brown rice and fish curry combo; the delicious, satisfying, comfort meal. Mmmmm…. Enjoy! Green chili : 2 nos. Dried Red chili : 1 or 2 nos. Clean and dry the fish pieces. Soak the tamarind in one glass warm water and squeeze well to take out the pulp. Drain and keep the pulp aside. 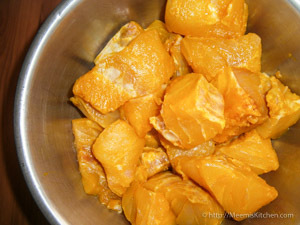 Marinate fish pieces with Turmeric powder, salt and 2 tbsp tamarind pulp. 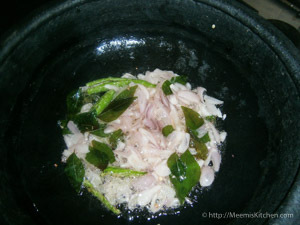 Heat coconut oil in a Clay pot/ earthen ware or Kadai and add curry leaves and green chilies. 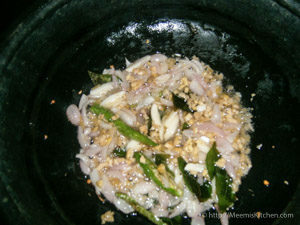 Add the sliced shallots/ small onion, chopped Ginger and Garlic and fry for few minutes. Then add ginger garlic paste and fry for few minutes, stirring constantly. 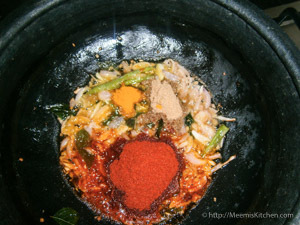 Keep on low flame and add Coriander Powder, Chili Powder and turmeric powder. Next add chopped tomatoes and sauté for few minutes till they are mashed. Put one pinch of Asafoetida powder or Uluva Powder. Pour the tamarind pulp and bring to a boil. Slowly pour the skimmed coconut milk or Randaam Paal (1 cup), adjust the salt and turn up the heat. 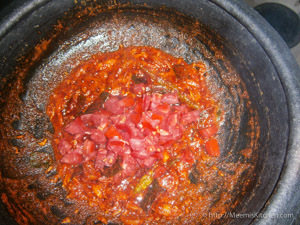 Once it boils, add the fish pieces and combine well. Cover and cook for 8 – 10 minutes stirring in between. (swirl the pot). 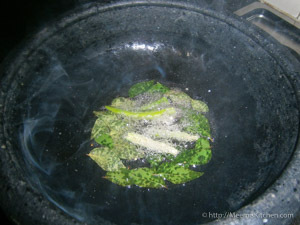 If you are using Manchatti, switch off the flame a little earlier as it will continue to cook for few more minutes. Then add the thick Coconut milk (half cup) and swirl the pot to combine. 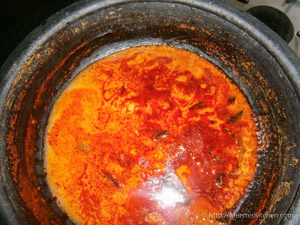 Heat little coconut oil in another small pan, crackle mustards, curry leaves and red chili. Garnish the fish curry with this. Serve with steaming rice, Kappa, Appam, Idli etc. Relish the aroma and taste. Adjust the spices according to your spice level. Green chilly should be medium spicy. 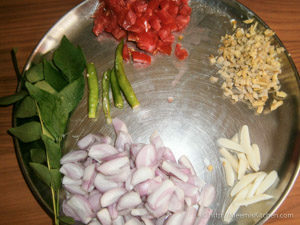 Small onions (Shallots) should be used for authentic taste. Use Kashmiri Chili powder to get that refreshing, deep Orange color to the dish. You can use either Asafoetida powder or Toasted Fenugreek powder. I used Asafoetida powder and it turned out awesome! Coconut oil should be used for best results. Please try this recipe, and don’t forget to let me know if you like it through comments. Please share with your friends using the buttons on the side- that would really encourage me. God Bless!! Thank you so much for your encouraging comments. Happy to know it came out well for you. Keep visiting!